Discover the tradition and whimsy of the Plaza Bunnies through April 3. A map is available for the plaza bunnies and royals rabbit in KC. Enjoy live music by Kansas City bands on Easter Sunday, March 27 from noon - 3pm with Sean McNown in the Mermaid Courtyard and A la mode in the Penguin Courtyard. Looking for an Easter brunch spot? Enjoy beautiful outdoor dining at one of our scrumptious cafes or restaurants. From buffets, famous buttermilk griddle cakes, to Eggs Benedict...so many choices. A complete list of Kansas City restaurants is available. Reservations recommended. 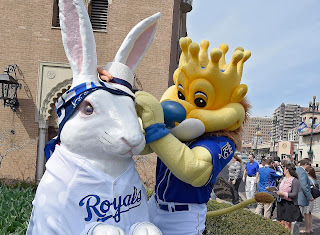 Don't miss our favorite Kansas City Royals mascot Sluggerrron Monday, March 28 from 11:45am - 12:30pm as he helps suit up the Plaza Bunnies in Royals jerseys in honor of KC's World Championship team and the season home opener. Forever Royal Bunnies will be on display through April 3 to celebrate the Kansas City Royals and Royals rabbits on the plaza. easter plaza kc spring activities KCMB Kansas City News, official kc news site with breaking stories on The Kansas City Royals, Chiefs, charity events, the 2012 MLB All Star Game, weather, sports, MU, KU, ufo sightings, dui checkpoints, Kansas City neighborhoods, nightlife, concerts, the Sprint Center, the Power and Light District and current Kansas City news articles.